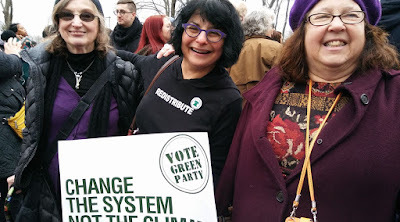 The Next Stage: Women and Retirement: The January 21 Women’s March: For the first time since the election, I am feeling hopeful. The January 21 Women’s March: For the first time since the election, I am feeling hopeful. What was truly wonderful about the Women’s March was that it bubbled up from the grassroots. Teresa Shook, a retired attorney in Hawaii was deeply dismayed by the election of Donald Trump; she turned to Facebook and asked: What if women marched on Washington around Inauguration Day en masse? The response was overwhelming. It appears that more than 2.5 million people participated in marches across the U.S. on January 21. We believe in accountability and justice for police brutality and ending racial profiling and targeting of communities of color. Women of color are killed in police custody at greater rates than white women, and are more likely to be sexually assaulted by police. We are also committed to disrupting the school-to-prison pipeline that prioritizes incarceration over education by systematically funneling our children—particularly children of color, queer and trans youth, foster care children, and girls—into the justice system. We believe in Reproductive Freedom. … This means open access to safe, legal, affordable abortion and birth control for all people, regardless of income, location or education. We must end the pay and hiring discrimination that women, particularly mothers, women of color, lesbian, queer and trans women still face each day in our nation. We recognize that women of color carry the heaviest burden in the global and domestic economic landscape, particularly in the care economy. We reject mass deportation, family detention, violations of due process and violence against queer and trans migrants. The platform articulates an inclusive conception of feminism which will appeal to a younger generation of feminist men and women. According to a report in the New York Times, the organizers made “a deliberate decision to highlight the plight of minority and undocumented immigrant women and provoke uncomfortable discussions about race. 'This was an opportunity to take the conversation to the deep places,' said Linda Sarsour, a Muslim who heads the Arab American Association of New York and is one of four co-chairwomen of the national march. 'Sometimes you are going to upset people.'" I remember people saying things, it’s not the NAACP, we represent all women and there was a certain group who wanted it all to be about race. ... We had to concentrate like a laser beam on women’s rights because it helps all women and we can’t be sidetracked with other issues. I remember there being disagreements on how we should go about that. They didn’t think [Germantown NOW] would last because it was founded for the wrong reasons. …People thought it was going to take us off track. ...the particular people involved seemed to be more interested in fighting racism rather than sexism. At the time, we had to focus on getting the ERA passed..
We have made progress. Young, 21st century feminists see the struggle for racial justice as integral to the struggle for gender justice. It's not an either/or. 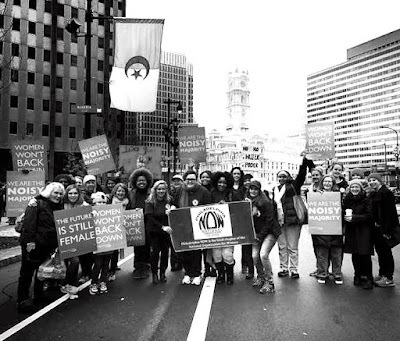 Most of the speakers at the Philadelphia March emphasized an inclusive feminism. Unfortunately, the audience was not as racially/ethnically diverse as I had hoped. The good news was that there were many young people, including young men. Both men and women responded enthusiastically to the call for an inclusive movement for gender justice. I’m not saying that I will never stand in solidarity with masses of White women under the umbrella of our gender, but it won’t be this weekend...It won’t serve my own mental health needs to put my body on the line (a body that I believe will invite more violence from Trump supporters than paler attendees) to feign solidarity with women who by and large didn’t have my back prior to November. Not yet. Eventually? Perhaps. But not now. We are beginning to have honest conversations and the energy to resist the Trump agenda is clearly out there. For the first time since the election, I am feeling hopeful. Retirement? What's that? I lost my home 9 years ago, had to bleed my retirement income to save my family from being in the street, now live in a small tiny apartment under a sloped roof with hubby and 26 year old daughter, still working probably til age 99...will lose most of what I paid into so-called Social Security...hubby is now blind...still works but not sure how long...daughter in school part-time...government now saying they "overpaid" hubby's SSDI when he was out of work 9 years ago...like I said...what's retirement...I'm an independent contractor...no salary, sick or vacation time...is that respect??? No, it isn't.